The smell of my newborn sons, the smell of the sand and ocean at Marconi Beach on Cape Cod, Drakkar Noir, fried chicken, Thai basil – these are a few of my favorite scents. Each one is unique and makes me smile…and makes me hungry. If you ever need to find me at an Asian grocery store I’ll be in the produce section, specifically where the Thai basil is. (And if I’m not there, I’ll be in the bakery.) I have never done a drug in my entire life, but I seriously get high smelling Thai basil. To me, it’s beyond just a pretty smell. It’s like hearing a song that makes you happy and you can’t stop smiling after it’s over. My song choices change all the time, but currently the first two that come to mind are Love on Top by Beyoncé and Sam Smith’s Restart. Picture me listening to those two songs with bouquets of Thai basil in my hands. Actually, don’t. I just did and I got an image of a panda rolling around with eucalyptus trying to sing. Maybe Thai basil is an actual drug. Whatever it is, Thai basil and Thai food in general are amazing and make me think of nothing but happy thoughts. When I worked in Boston’s Back Bay, my friends I would go to lunch at Bangkok Blue, which was located at the finish line of The Boston Marathon. They had the absolute best pad Thai I had ever eaten. We would have the most delicious, laugh-induced lunches there. And somehow we managed to walk back to work and stay alert for the remainder of the day, despite exhausting ourselves from laughing and our food comas. One of the things I remember all of us laughing about was when one of us opened our menu and found that someone wrote “until” between “Bangkok” and “Blue.” We were puzzled. Then we started saying it out loud and realized what we were actually saying! Juvenile? Yes. Hilarious? Absolutely. There used to be a Thai restaurant in the town where I live and it was really good. When my family and I moved here, I was newly pregnant with my second son and craved Thai food. So after a day of moving I went to the restaurant to pick up our take-out. I was in shorts, a t-shirt, sneakers, and probably covered in dirt. As I was waiting for my take-out, a father and teenaged daughter came in. We smiled at each other and the father said to me, “Table for two please.” I smiled again, trying so hard not to laugh, and mentioned that I didn’t work there. The daughter was horrified and said, “Dad! You are so embarrassing!” I still laugh thinking about that. Mostly because, why would a restaurant employ a hostess that dressed like she was just rolled down a dirt hill and shaking with hunger because she and her baby were craving pad Thai? As you can probably tell, pad Thai is my favorite Thai dish of all time. But one day I decided to venture out and try a Thai curry. I think I was at Bangkok Blue when I became adventurous and ordered yellow curry. After my first bite I thought, “What took me so long to try this? !” Then I thought, “How do I make this at home? And I really needed to learn how to make it at home because sadly, both Bangkok Blue and my neighborhood Thai restaurant have both closed. If you haven’t been on Fine Cooking’s interactive Recipe Maker (http://www.finecooking.com/collections/cyor-landing.aspx) I highly recommend it. 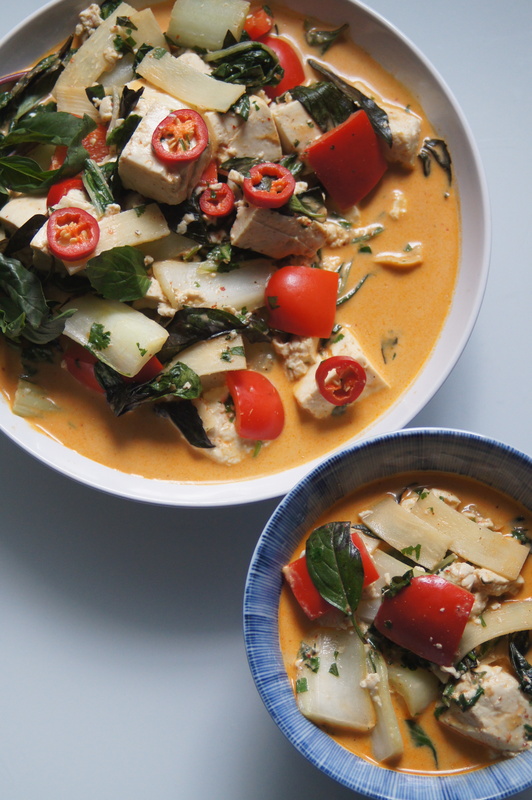 With the help of the Recipe Maker I was able to make this Thai Yellow Curry with Tofu. (If you prefer to make this with chicken I’ve included the instructions for that too.) Fine Cooking has different categories for different types of recipes that you can create, like stews, cheesecakes, and risotto, just to name a few. You choose the ingredients and flavors you want to use and The Recipe Maker will generate the amounts and instructions. It’s really helpful and fun. Not to mention genius. 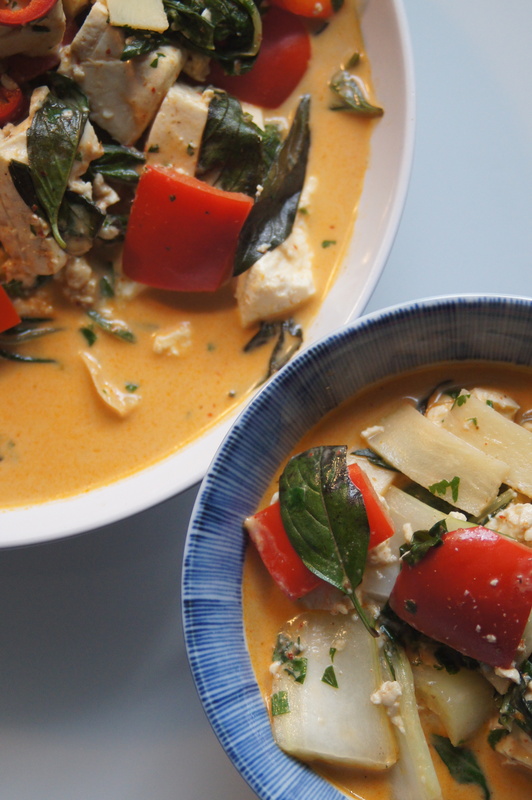 I haven’t made Thai Yellow Curry with Tofu in quite a while, but when I did just now I fell in love again. When the coconut milk first hit the hot pan I remembered from the aroma that I was about to make some greatness. Then when I added the yellow curry paste it was another layer of sweet scents along with a pretty, bright color. That’s what I love about this recipe. As you add the ingredients it just gets more and more beautiful. And that’s exactly how it tastes. Shake the can of coconut milk or stir it well. Place a 3- to 4-quart saucepan or wok over medium heat. Simmer ½ cup of the coconut milk, stirring occasionally, until reduced by about half, 3 to 5 minutes. It will get very thick and shiny and may or may not separate; either is fine. Add the curry paste, whisk well, and cook, continuing to whisk, for 1 minute. 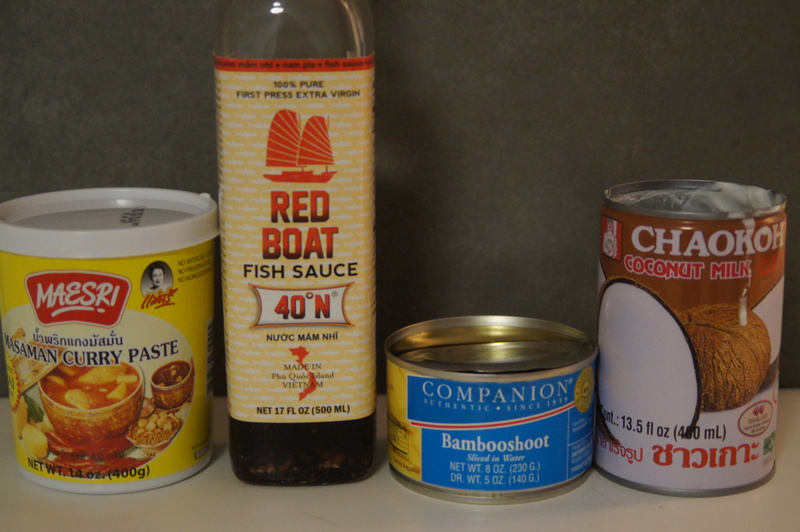 Whisk in the broth, sugar, fish sauce, and remaining coconut milk. Bring to a simmer over medium-high heat. Add the ginger slices (and chicken, if using) and continue to simmer, adjusting the heat as necessary. After 2 minutes, add the tofu and bell peppers and continue to simmer. After another 2 minutes, add the bamboo shoots and bok choy and simmer until everything is tender and cooked through, about 1 minute more. Remove the curry from the heat. Season to taste with more sugar and fish sauce, and add the basil and cilantro. Transfer to a serving bowl or serve right out of the pot. If you want, you can remove the ginger slices or eat around them. Garnish with basil and cilantro and enjoy!